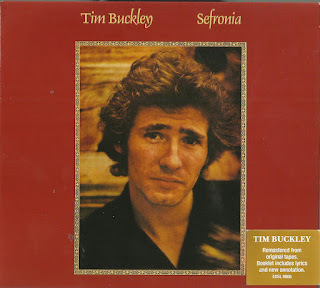 Released in November, 1973, Sefronia was the eighth album in the recording career of Tim Buckley. Originally released on the DiscReet label, an imprint set up by Buckley's manager, Herb Cohen, and another of his managerial charges, Frank Zappa, it is an eleven-track set that has few long-time Buckley fans willing to extol its virtues. None of which reads like a promising start to an album sleeve note, but, at over forty years' remove, and looking at other posthumous releases, it's now possible to view Sefronia in a somewhat kinder light. On the front cover photo, Buckley wears an odd, slightly bemused expression, which might shed some light on his state of mind, and may also provide a key to the content of the album. Rock pundits and long-term Buckley fans have, on balance, regarded this, and the succeeding album, Look At The Fool, as the dying embers of a once-great artist's career, low on inspiration, luck, and decent album sales. Long gone are the vocal ululations and wordless soundscapes of Lorca and Starsailor; in their place shorter, more concise songs and excursions into funky musical terrain. His previous album, 1972's Greetings From LA, had Buckley dig deep into an at times brutally frank carnality, the Romanticism of yore giving way to celebrations of creaking bedsprings and cruising singles bars. It was very good, though, and his musical and lyrical re-invention was an artistic success, even if the sales were, frankly, poor, and his then recording home, Warner Brothers, declined to pursue any further interest in him. Maybe manager Cohen had said "well, we've tried it your way, now let's try it this way..." Or perhaps Buckley was biding his time, with his eyes on other projects. He had been considering, with his lyricist friend Larry Beckett, a musical treatment of the Joseph Conrad novel, The Outcast of the Islands, and was even considering acting roles. After all, he was hardly old - in his mid-twenties, and he'd already released such a fine body of often tremendous music. That refused to sell. A study of the compositional credits on Sefronia reveals that five of the album's eleven tracks are non-originals. And, for Buckley fans, herein lies the rub. Whether it was at the insistence of his manager, Herb Cohen, or having a producer, Denny Randell, imposed on him, and the demands of bringing an album of usable material in time and on budget for a label where Cohen held the purse strings was putting a brake on Buckley's creative energies. Or maybe it was his growing immersion in booze and drugs - it is impossible to say, but I would suggest that these were all forces at work here. To give Cohen his due, he had supported Buckley throughout the 'difficult' Lorca and Starsailor periods, in which he produced music that some would say was easier to admire than to truly love, and it could be that he was wanting to press the 'reset' button on Buckley's career. Furthermore, Randell's production does at least gift Sefronia with a cohesive sound, not quite the fat funk of Greetings From LA, but it has solid production values in an era when a rock and roll audience was wanting to get more out of the expensive hi-fi equipment they were investing in. Sefronia opens with a step back to his early troubadour days for Buckley, with a cover of 'Dolphins', penned by former Greenwich Village Folkie and troublemaker, Fred Neil. It's a song that had been in Buckley's repertoire for many a year — it is included in the epochal, posthumously-released live album, Dream Letter, recorded at London's Queen Elizabeth Hall in October 1968, but Neil's influence on Buckley goes way beyond that. Neil added his hectoring baritone to 12-string acoustic guitar, and Buckley had done the same whilst establishing his presence on the New York coffeehouse circuit, although on the Sefronia take, TB favours his trusty Fender electric XII. Neil was, by the early seventies, living in seclusion in Cocoanut Grove in Florida, devoting his time to studying the dolphins he once sang about, and freeing himself from the yoke of substance abuse (his self-imposed exile was no doubt softened by the arrival of substantial songwriting royalties accruing from the global success of 'Everybody's Talkin", a Neil cover by Harry Nilsson as featured in the soundtrack of the smash hit movie Midnight Cowboy, in 1969). Buckley clearly enjoys singing the song; there's no dialled-in vocal here, with TB thoroughly investing himself in the wistful lyrics. The arrangement is on the slightly over-egged side of good, with Buckley's twelve string chords providing a ringing harmonic pad for Joe Falsia adding melodic curlicues of guitar. The jazz waltz-time rhythm is perfectly judged, and it's a pretty fine way to kick things off. There is great footage of Buckley performing the song on the longrunning British rock music show, The Old Grey Whistle Test, from 1974, where he is backed by a pick-up band of British musicians - Buckley is in superb vocal shape, and it is easily found on a web search. Setting rather more of a tone for the rest of the album is 'Honey Man', which wouldn't have been out of place on Greetings, and Buckley ups his vocal game here, supported by a muscular funk backing and real sense of purpose. It's one of four tracks penned by Buckley and his sporadic lyric collaborator, Larry Beckett, and has slightly more of the poetic in its libretto. 'Because Of You1 is cast in a funk setting, and is graced with another excellent Buckley vocal, the track building up a pretty good head of steam over its four minutes plus duration. The demo of'Because of You', released on The Dream Belongs To Me collection reveals an even more busier Funk take, which would imply that this move into funkier waters was Buckley's aim, and not thrust upon him by producer Randell. The most ambitious piece on the album is the title track, which is in two halves - 'Sefronia: After Asklepiades, After Kafka, and 'Sefronia: The King's Chain', and is a partial reprise of Buckley's more dreamier early days, incorporating marimba, his own electric 12-string chords, congas and a thin string arrangement that is redolent of what Willie Mitchell did on contemporary Al Green recordings. It was a pleasant reminder of the more musical and lyrical ambitions of his 'Blue Afternoon' era, although it seems somewhat unfinished, and perhaps with a little more work, could have been polished up into something even more substantial. As it is, it is still a fine piece. 'Quicksand' and 'Stone In Love', the two tracks which bear Buckley's sole writing credit, are pretty good, the former being a taut, edgy piece of funky rock, with some excellent chord changes and an energized vocal, and the latter being an insistent, busy piece that's perhaps a little padded out - excellent vocal again. 'Martha' is a Tom Waits song from his first album, Closing Time (also released in 1973), and its deep vein of sentimentality is an emotional plain that Buckley had never really explored up until now. Buckley offers up a pretty decent interpretation of the song, and the string / woodwind arrangement is luxuriant even though it's slightly out of kilter with the album's often earthier feel. One online critic has likened Buckley's vocal to that of later era Neil Diamond! It's a very sweet song, but there's a rather more prosaic reason behind Buckley's recording of it; Waits and Buckley shared management back then in the shape of Herb Cohen, and he was always keen on pushing his artists through having them pick up cover versions. He had rather more luck, sales-wise, with Waits Oil’55, which was covered by The Eagles on their 1974 album, On The Border. Of all the brought-in material, it is “I Know I’d Recognize Your Face' that is perhaps the most contentious here. A rather limp duet, lame of rhyme and dull of lyric, with vocalist Marcia Waldorf, Buckley is on autopilot, and this is forgettable stuff. Waldorf would go on to record a pretty decent solo album for Capricorn Records, by the way. 'Peanut Man', penned by Fred Freeman and Harry Nehls, is pretty poor, too, and seems to have been an attempt to write a song in the vein of 'Coconut', by Harry Nilsson, with equally dispiriting results. However, accentuating the positive, the album closer, a cover of the old Jaynetts hit, 'Sally Go Round The Roses', is very good indeed, and far from the throwaway that its presence may suggest, Buckley using the original as a base upon to wrote his own interpretation, skewing the lyrics into outre territory – he switches the lyric from "Sally don't you go, don't you go downtown; saddest thing in the whole wide world is to see your baby with another girl" replaced with "Oh Sally don't you go down, oh darlin' don't you go downtown; Honey the saddest thing in the whole wide world is to find your woman been with another girl." The song became a strong part of his live set – indeed. The critical response to Sefronia wasn't too savage, as it turned out, but there was no discernible upswing in Buckley's sales, and his relationship with his manager, Herb Cohen, was becoming increasingly strained. Buckley was drinking heavily, and had been edging deeper into drug abuse, as he searched for a way out of his career impasse. 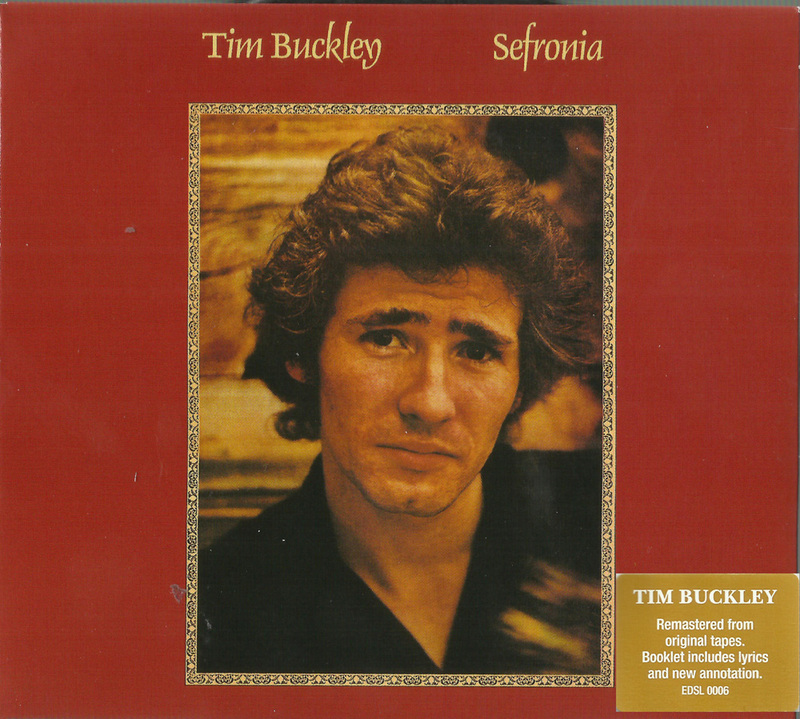 Buckley promoted the UK release of Sefronia with an opening slot on the very first Knebworth Festival (dubbed the 'Bucolic Frolic') on a bill that featured The Sensational Alex Harvey Band, The Mahavishnu Orchestra, Van Morrison, The Doobie Brothers, The Allman Brothers Band, on July 20th 1974. His band consisted of Art Johnson (guitar), Jim Fielder (bass), Mark Tiernan (keyboards) and Buddy Helm (drums), and the set featured 'Nightkawkin", 'Dolphins', 'Get On Top Of Me Woman', 'Devil Eyes', 'Buzzin'Fly', 'Sweet Surrender' and 'Honeyman', and a four minute improvisational section at the end of the set - bootlegs of the show do exist. Despite the fact that Buckley was essentially performing whilst the crowd was arriving and setting up their place for the day, he performed very well, and those who paid attention were very impressed by his dynamic performance. Thank you, Tim is always appreciated - as are all your efforts. Obrigado Irmão. Tim Buckley Forever. Luv Tim ... thanks a bunch.